This Bookreporter.com Special Newsletter spotlights a book that releases this winter. 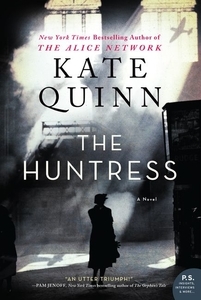 Read more about it, and enter our Winter Reading Contest by Tuesday, February 12th at 11:59am ET for a chance to win one of five copies of THE HUNTRESS by Kate Quinn, which will be available on February 26th. Please note that each contest is only open for 24 hours, so you will need to act quickly! Growing up in post-war Boston, 17-year-old Jordan McBride is determined to become a photographer. When her long-widowed father unexpectedly comes homes with a new fiancée, Jordan is thrilled. But there is something disconcerting about the soft-spoken German widow. Certain that danger is lurking, Jordan begins to delve into her new stepmother’s past --- only to discover that there are mysteries buried deep in her family...secrets that may threaten all Jordan holds dear. - Click here to visit Kate Quinn's website. - Connect with Kate Quinn on Facebook, Twitter and Instagram.